Despite pretensions to eternity, we know that art is fixed in time, rooted to the moment of its creation and distribution. The historical exigencies that led to the creation of Norman Rockwell’s Four Freedoms suite are well known. President Franklin Delano Roosevelt had designated the Freedoms—freedom of speech and expression, freedom of worship, freedom from want, and freedom from fear—in his January 1941 Message to Congress. In May 1942, when Rockwell toured the US Department of War, casting about for opportunities to be helpful, the memory of Pearl Harbor was still fresh, and recent news from the Pacific theater of war had been mixed. Seventy-six thousand American and Filipino troops had surrendered to Japanese forces on the Bataan Peninsula, Philippines, on April 9. The US Army Air Forces’ Doolittle Raid on Tokyo (emotionally satisfying, if not particularly effective) had followed on April 18. All that spring, from Hawaii to California to Washington State, government agents were rounding up Japanese Americans, stripping them of their property, and depositing them in isolated camps. When Rockwell finished the suite at the end of 1942, the tide had turned in the Pacific, although a bloody slog remained. Europe remained occupied by the Axis powers; Americans had yet to land in Sicily, and the Allied invasion of Normandy was still eighteen months off. All told, the Four Freedoms paintings were undertaken in a deeply unsettled moment. Our return to Rockwell is likewise grounded in time. Revivals always reveal latter-day concerns. Amid the tumult of 2016–18 in the United States, we should note that until quite recently, any attempt to reengage with Rockwell’s Four Freedoms might have come off as quaint or triumphalist. After all, the victory over fascism and the achievements of the postwar era have been amply celebrated. Paeans to the so-called greatest generation had grown cliché within the first full decade of this new century. The enterprise this catalog marks might well have been a giant bore. But alas, no. Today we take up the Four Freedoms newly alert to the dangers of complacency. We face radical discontent of more than one stripe and eroding trust in our institutions, even in the very legitimacy of our elections. All of this matters greatly. Our civic health is subject to other measurements, too. The plague of cheap talk and bad faith in contemporary America threatens our thinking. The headlong rush to the battlements to fend off Vandals, whoever they may be, erodes our capacity to weigh carefully and judge discerningly. Discernment takes practice. And culture provides the raw material to practice on, valuable precisely because life and limb are not at stake. If we have grown used to the notion of culture war, that is an indictment of our era. In divided times, a reliance on melodrama can be a safe—if also culturally stunting—path. Certainly the fare at the movies has descended into juvenilia, particularly comic book melodrama. Ironically, the superheroes who nowadays stalk the multiplex were invented by Jewish kids in the late 1930s. They were understandably in thrall to the wish fulfillment of special powers, having learned through family networks of the mortal danger to European Jewry. Well before the United States entered the war for which Rockwell propagandized, superheroes had begun battling Nazis. As for today, we might do with fewer cosmic battles against galactic villains. Our requirements are simpler: legislators, holiday partygoers, everyday persons who object to indecency. But because big-dollar returns for The Avengers and its ilk are predictable, the studios continue to serve up spectacular, repetitive fare. Fig. 1. Alex Schomburg (1905–1998). 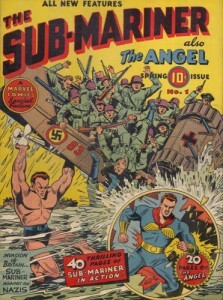 Cover illustration, The Sub-Mariner No. 1, “Deep-Sea Blitzkrieg,” Timely Publications, Spring 1941. By such a route—a reflection on melodrama—do I arrive at what may seem like an impertinent question. 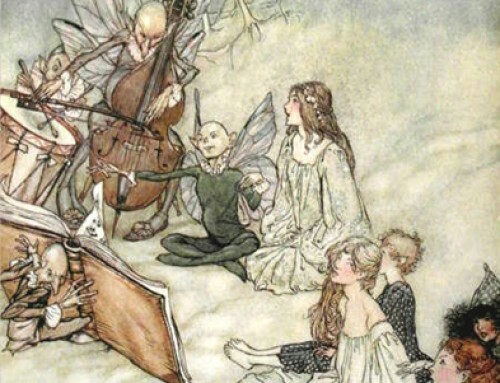 As we return our thoughts and gaze to Franklin Delano Roosevelt’s alliterative quartet and Norman Rockwell’s visualizations of it, we have an obligation to ask: Are these things any good? That is, are the illustrated Four Freedoms cultural work of high merit? Or should they, all these decades later on, be best understood primarily as skillfully wrought pablum? But that is no matter. Historically and critically speaking, Rockwell matters now, just as previously scorned categories of cultural production like genre fiction and television do. The old hierarchies of taste have aged poorly, and we can be thankful for that. But that is not the whole story. To dispense with the vertical axis of high and low is not to abandon judgment or forswear criticism. To the contrary, a vital pluralism relies on rigor, lest it slip into naive enthusiasm or louche fellow-traveling. Let’s take Rockwell seriously. What has he got to show us? Fig. 2. Maurice Merlin (1909–1947). 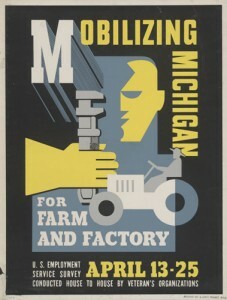 Mobilizing Michigan for Farm and Factory, 1941–43. 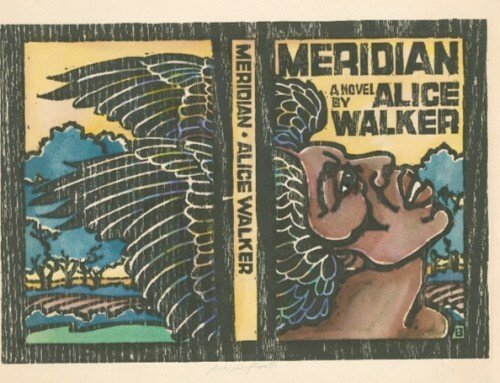 Poster, Michigan Art and Craft Project, Work Projects Administration. Library of Congress Prints and Photographs Division, Washington, DC. Fig. 3. George Petty (1894–1975). 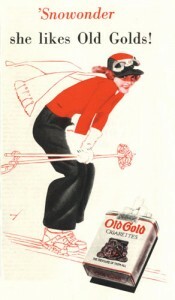 “’Snowonder she likes Old Golds!” Two-color print advertisement, Collier’s, January 28, 1939. These were the vocabularies available to an American illustrator who aspired, as Rockwell did, to give plastic form to universalizing language aimed at a wartime popular audience. The abstractionist forswore anecdote, simplifying planes and eliminating local detail to create a sense of the mythic. Rockwell did the opposite: he committed to particulars. His Everyman would be Somebody. As a matter of general practice Norman Rockwell cast the characters in his paintings much as a film director might, painstakingly building his tableaux through repeated sittings and photo shoots. All of his characters were somebodies. The method suggests the illustrator as a documentary allegorist, which is accurate as far as it goes. But Rockwell’s persuasiveness as a maker of illusions—skillfully rendering characters as well as objects and settings—served as a Trojan horse. 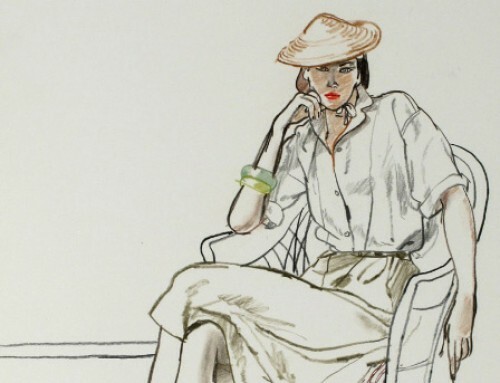 The illustrator’s verisimilitude masked the hidden caricaturist within, the secret to his beloved warmth and liveliness. As a comparison of his photographic contact sheets and his finished paintings suggests, Rockwell exaggerated unmistakably, investing—goosing, really—a given pose or a model’s expression with a boost of animation at a controlled rate; the exaggeration was perceptible, if barely. Cloaked in realist garb, such comedic adjustments went unseen. 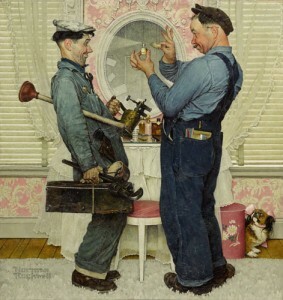 The maneuver is most evident in Rockwell’s Saturday Evening Post covers, and is easiest to spot in particularly performative scenes, such as The Gossips (1948) and Two Plumbers (1951), the latter reproduced with but one of the forty-five reference photographs shot for the project. The left plumber’s stance, gesture, and expression were highly directed, as the photograph shows. His features (evocative of silent film comedian Stan Laurel) and gestures are visibly more plastic in the painting. Fig. 4. 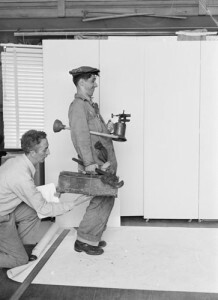 Unknown photographer, Reference photograph for Two Plumbers, 1951, cover illustration for The Saturday Evening Post, June 2, 1951, Norman Rockwell Museum Collection, ST1976.8035, ©Norman Rockwell Family Agency. All rights reserved. Fig. 5. Norman Rockwell (1894-1978), Two Plumbers, 1951, cover illustration for The Saturday Evening Post, June 2 1951, oil on canvas, 39 ¼” x 37”, Private Collection, ©Norman Rockwell Family Agency. All rights reserved. Perhaps because he intended the Four Freedoms project to embody high ideals, Rockwell qua cartoonist is occasionally absent from the famous quartet. No matter. Audiences who had been looking at his Post covers since the last World War embraced Rockwell’s amplified specificity, perhaps even filling in blanks, in the service of Roosevelt’s rhetoric. The Four Freedoms did not run as magazine covers but rather as interior pages in the Saturday Evening Post, which collaborated with the US Department of the Treasury to distribute them. 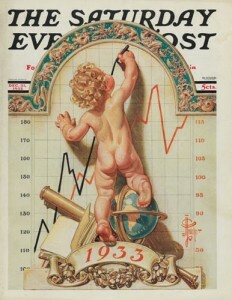 But all parties involved traded on Rockwell’s renown as a cover artist for the magazine to propel the project into the public eye. The modern Saturday Evening Post cover, as established most definitively by J. C. Leyendecker in the first decade of the twentieth century, consisted of a central motif, element, or scene suspended in a solution of negative space. No matter how adventurous Leyendecker’s later Post covers became, they remained almost militantly two-dimensional in spirit, resisting any urge to articulate a setting, or create a picture into which the viewer peered, as opposed to at which one looked. Norman Rockwell’s first Post covers followed the Leyendecker model, beginning with Boy with Baby Carriage (November 1917) and extending into the 1930s. Many of Rockwell’s finest covers of the 1940s and ’50s tackled ever more ambitious visual problems. The Four Freedoms help to mark the turning point toward more spatially ambitious pictures. Considered as a set, the Four Freedoms is an uneven affair that trades on Rockwell’s strengths but suffers from his weaknesses, albeit with the edge going decisively to the former. Freedom of Speech resonates yet condescends; Freedom from Want serves up the most satisfying aesthetic experience by withholding bounty; Freedom from Fear enacts Rockwell’s thematic squeamishness; and the weakest illustration, Freedom of Worship, domesticates its subject beyond all recognition, yet points to a future work, nine years on, that might qualify as the artist’s crowning achievement. Freedom of Speech has justly remained a durable image, if one undermined by class condescension. Rockwell’s Post covers conveyed an amiable social cohesion grounded in the rituals of middle-class small-town life. We associate Rockwell with a communal world—implicitly placing the (admittedly homogeneous) group at the center. Freedom of Speech cuts another way, if only to a degree. Fig. 7. 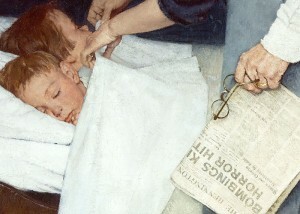 Norman Rockwell (1894-1976), Freedom of Speech (detail), 1942, illustration for The Saturday Evening Post, February 21, 1943, oil on canvas, 45 ¾” x 35 ½”, Norman Rockwell Museum Collection, NRACT.1973.021, ©Norman Rockwell Family Agency. All rights reserved. The humans, then, provide the mass of the painting. If you squint, they form a warmly colored A-frame structure—a Sienese baldacchino—flecked at the bottom by a yellow-red bowl of fruit. But the people are not the subject of the painting. They may provide subject matter, but the picture has other fish to fry. It is about something else. When experienced in person, at scale, Freedom from Want is a painting about an austere feast, a celebration of light. Dramatic though it may be, the uncarved turkey seems to be it for food, aside from blanched-looking celery, an aspic, and some fruit. We confront empty plates and colorless water. No heaping bowls, no spilling cornucopia, no bottles of wine. But the restraint does not suggest self-denial—far from it. 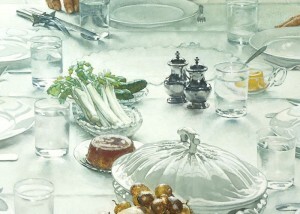 Rockwell paints an airy blanket of white light, sourced through the curtained window, that settles over the table, linens, china, silver, and glassware. Light suffuses everything, conferring grace on the gathering. Fig. 8. Norman Rockwell (1894-1976), Freedom from Want (detail), illustration for The Saturday Evening Post, March 6, 1943, oil on canvas, 45 ¾” x 35 ½”, Norman Rockwell Museum Collection, NRACT.1973.022, ©Norman Rockwell Family Agency. All rights reserved. Freedom from Fear offers formal comforts. A solicitous mother and tired, attendant father put their children to bed. The genre scene unfolds in an upper bedroom, the angle of pitched roof squeezing the picture from the upper left, complemented by the abbreviated diagonal of a stair banister on the right. Shapes in cascading light values spill down from the top: the man’s shirt, the woman’s (mostly obscured) white apron, an incipient horizontal slash of pillows, and a turned-down sheet. Next come the beige blanket and newspaper, and after them a set of blue gestures: a sword of skirt, the fallen doll, discarded clothing, a shard of dour wallpaper angling to an apex. Lastly, a satisfying notch, easily missed at the upper left: the corner of a framed devotional print—a throwaway in reproduction, surprisingly lovely in the original painting. I do not think it is fair to accuse Rockwell of lacking emotional range, exactly; at his best he captures longing, sadness, and pathos in addition to the impish joie de vivre we associate with him. But the personification of fear and danger were off the menu. It is odd, really. Consider that other beloved mid-twentieth-century American melodramatist Walt Disney. He could scare the bejeezus out of his viewers, and routinely did; think of the near murder of Snow White and her headlong flight; the transformation of boys into jackasses in Pinocchio; the forest fire in Bambi; the hallucinogenic pink elephants in Dumbo. Nothing in Rockwell comes close. Fig. 9. Norman Rockwell (1894-1976), Freedom from Fear, illustration for The Saturday Evening Post, March 13, 1943, oil on canvas, 45 ¾” x 35 ½”, Norman Rockwell Museum Collection, NRACT.1973.020, ©Norman Rockwell Family Agency. All rights reserved. Finally comes Rockwell’s attempt to illustrate religious pluralism, a subject fraught with cardboard peril. Unsurprisingly, Freedom of Worship brings up the rear of the quartet in all respects. Unlike the other three paintings, Worship is not situated architecturally. Fear and Want appear in domestic spaces, upstairs and down; Speech was staged in a public meeting room. Perhaps to avoid an ecclesiastical setting, thereby stacking the deck in favor of one faith over another, Rockwell creates a collage of heads in prayerful profile—a supplicant-as-sticker approach. A grandmotherly Protestant, perhaps flanked by her elderly husband, mostly obscured; a behatted Jew; a woman praying the rosary; a chin-stroking agnostic. Portraits in piety! Spatially, dramatically, and thematically, the picture is a dud. Rockwell did not have a religious sense of life, and his pictorial translation of faith conveys nothing of the essential strangeness of religion. Despite the inevitable domestication of faith into liturgical procedure and moral injunction, at the heart of all religious experience lies bizarre wonderment: the unconsumed burning bush, the unspeakable YHWH, the revivified corpse of Lazarus, the New Jerusalem in outer space. 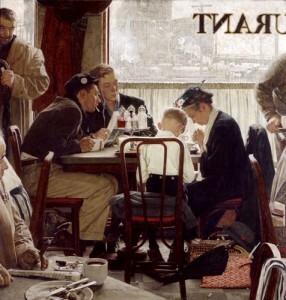 Rockwell would go on nearly a decade later to create Saying Grace, a vastly more potent take on private religion and public tolerance. It is arguably Rockwell’s very finest painting, and surely one of his best three or four works. That work, which appeared on the cover of the Saturday Evening Post on November 24, 1951, forswore pietistic generalization and returned to the Rockwell wheelhouse: specific people and settings—or getting to the general by way of the particular. Fig. 11. Norman Rockwell (1894-1976), Saying Grace, 1951, cover illustration The Saturday Evening Post, November 24, 1951, oil on canvas, 42” x 40”, Private Collection, ©Norman Rockwell Family Agency. All rights reserved. Encircled by cigar smoke, this piety is properly strange. The quiet modesty of the devotional act in Saying Grace reminds us that some of our neighbors live in the world but refuse to think themselves of it. The Mennonites are Anabaptist cousins to the Amish. Into the 1950s they set themselves apart, too, if less radically. Rockwell focuses on his rakish onlookers, quizzical in the face of this private act in a busy, chaotic setting. They register disbelief but hold their peace. Rockwell shares their skepticism, yet honors the simple ritual of blessing food. I can think of no other picture that more intimately captures the sacred and profane in American life, while somehow celebrating both. Critically speaking, Saying Grace amounts to a back payment on the disappointing Freedom of Religion (even if Rockwell himself was quite satisfied with the latter). Early in this essay I wondered whether an advanced cinematic economy in superheroes might amount to a kind of cultural sophomorism. I also suggested that Norman Rockwell’s melodrama suffers for want of the villains who populate his beloved Dickens. These are contradictory observations, which get to the heart of what is to be gained from a Four Freedoms revival now. 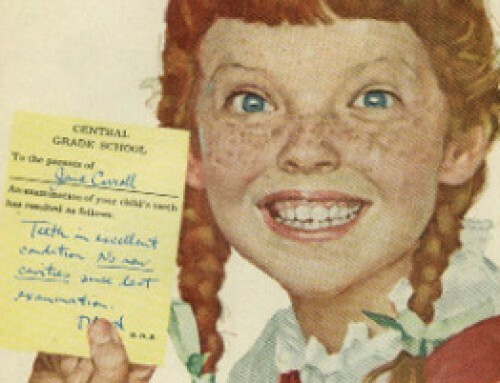 What can Rockwell’s propaganda offer us in a national episode of unexpected ugliness? Americans are having to relearn forgotten lessons. 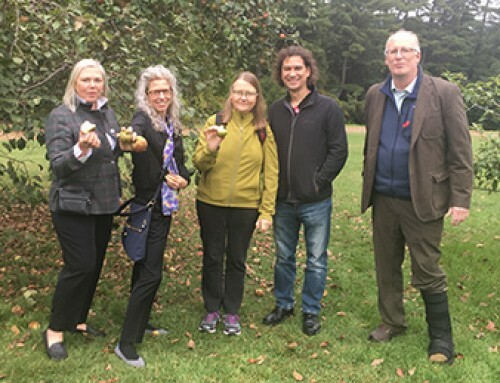 Chief among them are the disciplines of democracy, currently threatened by a decadent politics, too much money spent unaccountably by too few, and an immature communication regime of vast reach, traveling in disguise as technology. But we are still armed with a Constitution written by people who were deeply pessimistic about human behavior. They built a system designed to constrain the worst of it, with an extremely glaring exception. Under these conditions many people find themselves beset by temptations to Manichaean simplicity—good versus evil—even as they strain to keep George Orwell’s dictum top of mind: “To see what is in front of one’s nose needs a constant struggle.”[viii] How to stay attentive—to keep one’s lanterns lit—while staving off the deadly business of exhorting the infallible good guys against the irredeemable bad ones? Perhaps Norman Rockwell offers a useful lesson about essential human decency, within historical constraints. Perhaps his disinclination to vilify and demonize may be put to good use. Call it conflict avoidance if you want, but Rockwell’s willingness to empathize with almost anyone is admirable. [ix] Good criticism, for its part, extends hospitality by seeking first to describe so as to understand. Too often we lack such generosity now, in part because audiences on social media prize quick judgment and colorfully phrased dismissals. Rockwell rewards the slower take, once prized in American laps in domestic spaces, of an encounter with an illustrated magazine. Rockwell extends generosity to his characters and viewers alike, delivered through visual and dramatic attention to detail, complexity when necessary and simplicity when not, and sheer imaginative reach. If Norman Rockwell operated and created in a narrower (read: whiter) editorial landscape at the Post than we or he would have liked, in his way he made the circle bigger. He eschewed heroic generalization. He took people as he found them but improved them by investing them with an animated dignity. In his hands we are more charming, warmer, and possessed of more generous spirits than we are in real life. Now, to be sure, we must complicate this thought. Majoritarian myths are involved, appeals to sentiment, which tempt us to evade awareness of historical wrongs and to avoid fixing them. No elisions should be inferred. Let us not be untroubled. But neither let us refuse a gift. 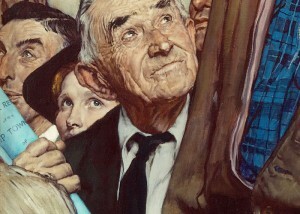 Norman Rockwell thinks better of us than we deserve. If he abstains from the manufacture of villains, perhaps we can, too. We could grow into a Rockwellian sense of decency, extend it into places and spaces he could not reach or even imagine, and put it to work in the world. Such freedoms will be worthy of our devotion. D.B. Dowd, Senior Fellow, is Professor of Art & American Culture Studies at Washington University in St. Louis, where he also serves as the Faculty Director of the D.B. Dowd Modern Graphic History Library. [i] The arguments of Clement Greenberg (“Avant-Garde and Kitsch,” Partisan Review, Summer 1939; “Towards a Newer Laocoon,” Partisan Review, July 1940) and Dwight MacDonald (Masscult and Midcult: Essays against the American Grain, Place of Pub: Publisher, 1960) need not be rehearsed here, but suffice to say, they prize difficulty over ease, opacity over transparency, and emotion over sentiment. [ii] Calvin Coolidge, addressing the annual meeting of the American Association of Advertising Agencies in 1926: “When we stop to consider the part which advertising plays in the modern life of production and trade we see that . . . it is that of education. It informs its readers . . . of commodities . . . and creates for them a wider demand. [Advertising] makes new thoughts, new desires, and new actions.” The stress on new underscores the antihistorical spirit of modernism itself; implicitly freed from the plodding past, we enjoy a freshly minted super-now of consumerist wonder. The pattern is borrowed from and shared with late nineteenth and twentieth century avant-gardisms. See Coolidge, “Address before the American Association of Advertising Agencies in Washington, D.C.,” October 27, 1926, American Presidency Project, accessed February 2, 2018, https://www.presidency.ucsb.edu/ws/?pid=412. [iii] Deborah Solomon, American Mirror: The Life and Art of Norman Rockwell (New York: Picador, 2013), 207. [iv] All that said, the mechanics of the figures reveal themselves reluctantly. I had looked at this image many times and never noticed the problem in the drawing. Only when I stood before the painting at length did I tease it out. [v] Rockwell’s biographers are Laura Claridge, Norman Rockwell: A Life (New York: Modern Library, 2001); and Solomon, American Mirror. [vi] This criticism is not, of course, to minimize the suffering of children bombed in the Blitz, as referenced by Rockwell’s headline. The same freedom from fear could reasonably have been demanded by the children of Tokyo and Dresden in 1944–45, or in Aleppo or in Sana’a, Yemen, today. [vii] Murder in Mississippi illustrated a story published in Look, June 29, 1965. 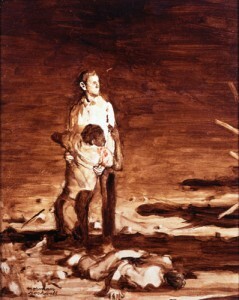 Rockwell, not knowing the precise details of the murders, based his interpretation on the 1963 Pulitzer Prize–winning photograph “Aid from the Padre” by Hector Rondon. In the painting, Schwerner holds Chaney in the same pose that Rondon’s priest holds a victim of violence in Venezuela. See Linda Szekely Pero, American Chronicles: The Art of Norman Rockwell (Stockbridge, MA: Norman Rockwell Museum, 2007), 211. [viii] “In Front of Your Nose,” Tribune (London), March 22, 1946. [ix] Within limits, of course; under certain circumstances, expressions of empathy evince moral failure. The events of August 11–12, 2017 in Charlottesville, Virginia, provided such an opportunity, duly seized. Executive rhetoric in the aftermath infamously descended to grotesquerie to extend a “very fine people on both sides” canopy over latter-day fascists. Empathy for regretful hotheads is one thing; racial malice aforethought takes us into different territory. Rockwell’s civil rights work for Look demonstrates that he knew the difference.